While most of us love their presence in song, birds can be quite the pest here early in the spring. Spring is mating season for so many birds that have made the trek to more northern climates. These birds are trying to be noticed and many are trying to build a nest near your porch or in your garden. If you are looking to deter birds from a particular area, there are products made specifically to deal with this problem. We will discuss some of our more popular products in this article. Plastic Molded Owls: Owls are a natural predator of birds and their characteristic body and eyes are recognized by birds, woodpeckers, and even small rodents that are being a nuisance in an area of your yard or garden. 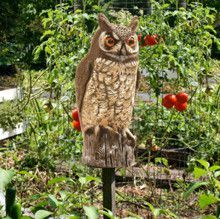 Place these owls in direct view of the problem area and move them around every few days or once a week where possible to keep birds and rodents off guard! Holographic Scare Tape: This scare tape is used where birds frequent. Its reflective qualities creates a moving reflection which frightens and deters birds as they are flying into perch, feed, or nest. To protect a garden, you will want to twist it from stakes surrounding your garden. To protect a windowsill or under a deck, you would be best served to cut strips and allow them to dangle in and around the area so that the birds see the reflective tape before flying in to perch or nest. There are lots of uses with this product, but the important step is to make sure that birds will notice the tape, so be sure that it is visible. Remember, this solution is often only temporary, so if it doesn’t look so appealing, you don’t have to keep it installed through the whole summer. Bird Repellent Paste: If you are battling with birds that want to perch (and/or poop) on ledges, window sills, gutters, or railings you will want to use a bird repellent. This repellent is available in a squeeze tube and simply applied to the ledge where needed. The product makes it uncomfortable for birds to perch because of its sticky nature, so they will not hang around. For porous surfaces, if you do not want to stain the stone, brick, or wood, we recommend that you use a waterproof tape or apply only to a surface after it has been sealed or painted.